The Gibb Report, says that the East Croydon – Milton Keynes route should be transferred to the London Overground. By 2020 London will have two high-capacity and two medium-capacity cross-London heavy rail routes, backed up by several cross-London Underground Lines. One line is missing from this list; the West London Line, which has a rather pathetic four tph between Clapham Junction and Willesden Junction stations. Until Southern got embroiled in their Driver Only Operation dispute, there used to be a very useful one tph service between East Croydon and Milton Keynes Central stations. The Gibb Report says this about the service. I believe there is an option to transfer the East Croydon – Milton Keynes operation to TfL and it’s London Overground concession in 2018. TfL may decide to change the service, for example by not running it north of Watford Junction, or running it to an alternative southern destination other than East Croydon. They could also develop the combined West London line service to better match available capacity to demand. They would have a number of crewing and rolling stock options, but should be able to operate the service more efficiently than GTR in the longer term, without the involvement of Selhurst. Selhurst TMD is the depot in South London, where the current Class 377 trains are based. I think that this is a good proposal for the following reasons. As was seen on the Chingford Branch Line, London Overground have a reputation for making a good fist of taking over services that need improvement. As the Gibbs Report says, the combined West London Line service could be developed. I have net quite a few people, who use this West London Line route to get to and from events at Wembley stadium. The service could call at Old Oak Common station to connect to Crossrail and HS2. A variant of London Overground’s new Class 710 trains, could probably work the shortened route, as either four or eight-car trains. The Class 710 trains could be based at the convenient Willesden TMD, along with the rest of the fleet. Being practical, a service of just two tph would give a train every ten minutes on the West London Line. The current service is supposed to stop at the following stations. Stations between Watford Junction and Clapham Junction, already have a substantial Overground presence. London Overground already run three tph on the Watford DC Line between Euston and Watford Junction stations. But would this be the ideal route? The West Coast Main Line is very busy and stations between Watford Junction and Milton Keynes are well-served by London Midland and Virgin Trains. So would it be sensible to continue a slower local service North of Watford Junction? It should also be remembered, that Southern introduced the original service to give better access to Gatwick Airport. Surely, this need is now satisfied by services from Clapham Junction and East Croydon. Could The Service Use The Watford DC Line? If this were possible, this must surely give advantages, especially if Watford Junctio is the Northern terminal. Dual-voltage Class 710 trains could work the route. The service level on the Watford DC Line would be increased. There would be no problem accessing the bay platforms at Watford Junction station. There would be no requirement for any paths on the West Coast Main Line. I think the answer to whether the Watford DC Line could be used at the present time is that trains going from the West London Line to Watford Junction must use the West Coast Main Line. 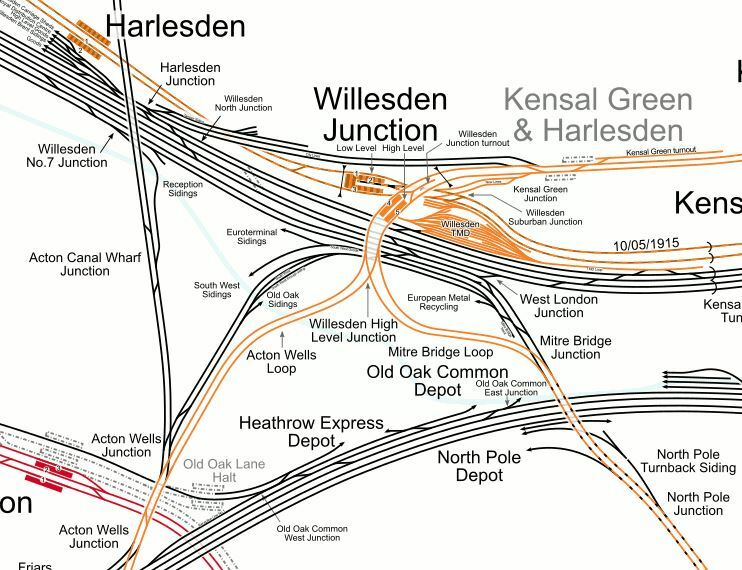 This map from carto.metro.free.fr shows the lines around Willesden Junction..
As it is all railway land, I suspect that the connection can be created. The one problem, is that some of the Watford DC Line is shared with the Bakerloo Line. But as the Bakerloo Line is being extended to the South and the Northern end will probably be improved, then surely creating an optimal solution to the Watford DC line, the Bakerloo Line and Overground services to Watford, makes a lot of sense. Various stations have merits and problems to be used as the Southern terminal for the service. Clapham Junction would appear to have a strong case, but London Overground had enough problems squeezing in their current services. As the station is now substantially step-free and has typically three tph to Gatwick Airport, Clapham Junction offers a good route to the airport. Balham has been used as a terminal in the past and connects to the Northern Line. If redeveloped for Crossrail 2, it could be a possibility. Streatham Common could be developed as a major interchange and if this happens, then surely is is a possibility. East Croydon would have a strong case, as it is a busy and well connected station, but there probably isn’t a suitable platform. I think that any station South of East Croydon is probably too far. My money would be on the new interchange station at Streatham Common, with Balham as an alternative. I estimate that a train doing a return journey between Watford Junction and Streatham Common would take under three hours, using the Watford DC Line. This would mean that three trains would be needed for an hourly service and six trains for a half-hourly service. Transferring the East Croydon – Milton Keynes route to the London Overground looks feasible. Seeing as at the moment Southern aren’t running a full service, I would think that restoring the full service would be desireable for passengers, like me, who regularly need to travel on the route. One main source of passengers is events at Wembley!